Three times I've tried. Three times I've failed. I know there's a museum in this castle but I never seem to manage to arrive when it's open. Never mind. Lindoso is worth a visit for other reasons. The first time I saw this little border village was in the early 1990s, before grants from the EU had improved the road, built the hydro-electric dam in the valley or brought trickle-down money to the people. In fact, it was actually something of a palaver to get there from Ponte de Lima, where I was staying, as communications were pretty poor. 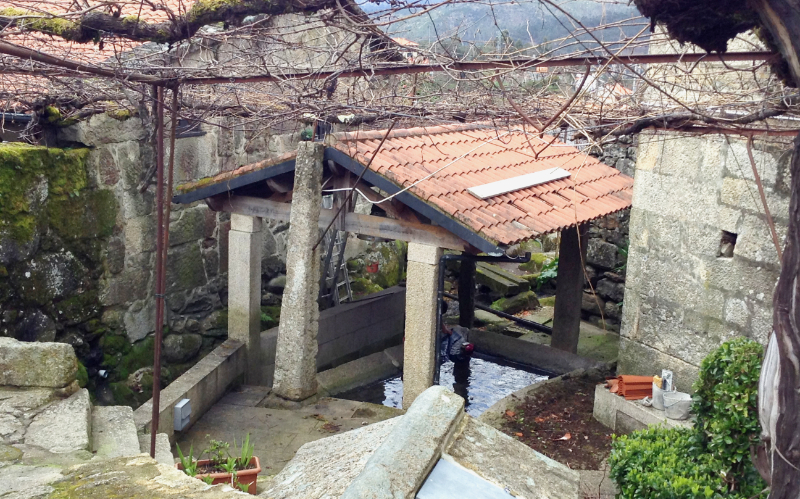 I took a bus up the Lima valley to Ponte da Barca, where I found the bus stop for Lindoso. There were only two buses a day but I was first in the queue, so clearly I would have my pick of the seats and the best view. In ones, twos and small groups short-statured women turned up. They were dressed in black, with head scarves, long knitted grey socks with elastic garters, like the ones we wore to school when I was a child, and heelless, slip-on shoes. Each had several enormous bags full of shopping and all were talking at the tops of their voices. The bus came... and guess who fulfilled the Biblical promise that "the first shall be last and the last shall be first"? Yes, it was me! How did you guess? I was, of course, relegated to the back of the bus where people whose elbows aren't sharp enough know they have to sit. 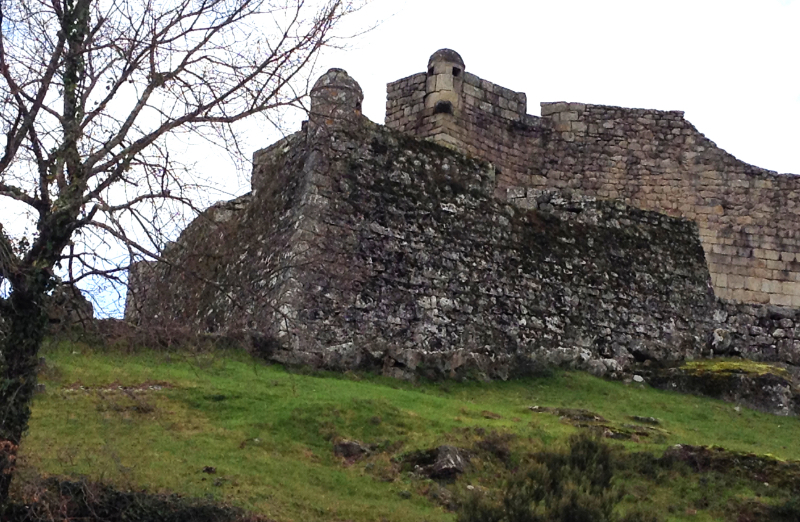 At Lindoso I got out and walked up the hill to the castle, planning to have a look inside and then find a coffee in a bar somewhere. The first idea turned out to be a non-starter as it was a Monday and everyone knows - except for me of course – that museums and monuments are mostly closed on Mondays. 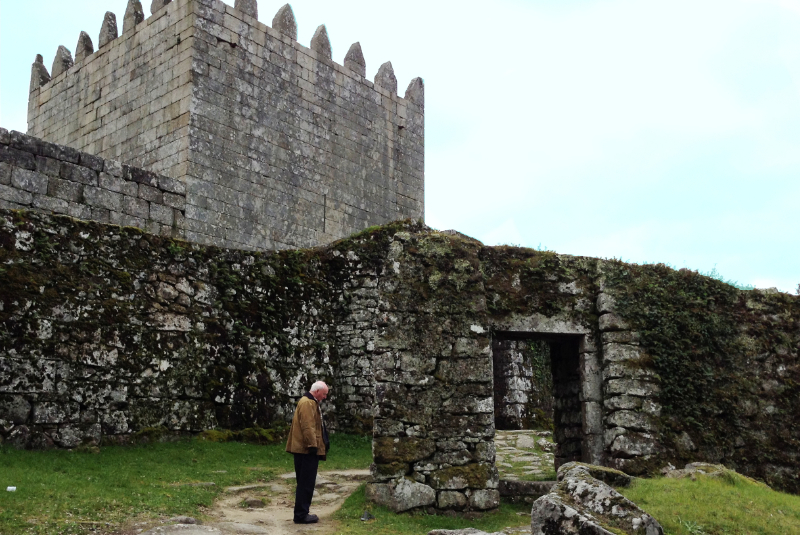 In fact, there wasn't a museum inside Lindoso castle at that time so I wouldn't have seen a lot but I would have got some idea of the kind life a soldier on border duty must have led in the days when Portugal feared invasion from Spain. From from the outside alone, it's clear it must have been pretty bleak. Once the drawbridge was pulled up you would have been cooped up in several layers of defensive walls with only a squat, blank-faced, windowless, defensive stone keep for shelter. I often think that in the past the life of a soldier anywhere was grim even when not at war. Some recruits will have had it relatively cushy in larger, more developed places like Guimarães. Other unfortunates, who drew the short straw, ended up in what must have seemed god-forsaken places like Lindoso. What was there to do all day up there in the mountains? What was there to eat except loads of vegetables? Portuguese kale is terrific but you can have too much of a good thing. I guess you played dice and quarrelled with your mates. Having failed to get into the castle, I walked round the wall thinking that I'd at least find that cup of coffee I was in need of. Below me I found a small herd of Minhoto cattle with long curved horns grazing around a particularly splendid group of espigueiros (for a description of these north-western Iberian structures and their use see The strange Sarcophogi of Soajo (http://www.me-n-youinportugal.com/index.php?blog&nid=17). 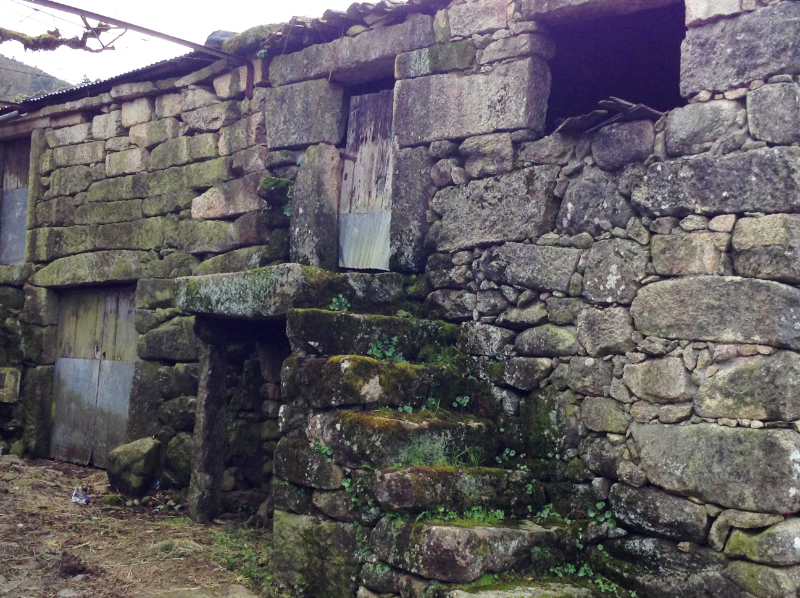 Whatever else grew around Lindoso in the past, there must have been a lot of maize because some of the granaries were twice the size of those I had seen in other villages. 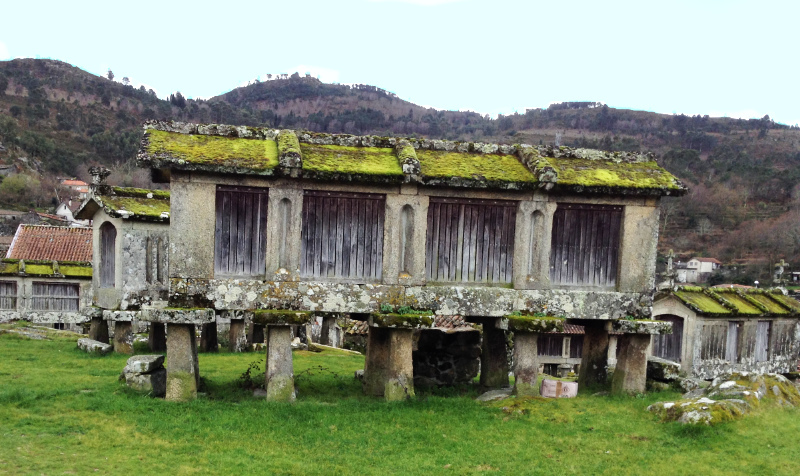 These espigueiros, now listed monuments, are clearly very old and their roofs are made venerable with encrusted moss and lichen. Further on still, at the edge of the village I found an old lady in traditional black clothes leaning against a house wall. She had rheumy eyes and leaned on a stick. "Good morning," I said, since it is customary for people to greet both friends and strangers when they see each other for the first time in the day. "Good morning," she replied. "I do so like to be out here in the sun." I loved the way she said it, using the diminutive, affectionate ending ..inho: o solinho – the lovely little sun. We fell to chatting about what changes she'd seen over the years. "Ooh lots!" she said. "When I was a young woman we used to smuggle things over to Spain. They were really poor over there, you know." This came as something of a surprise to me. 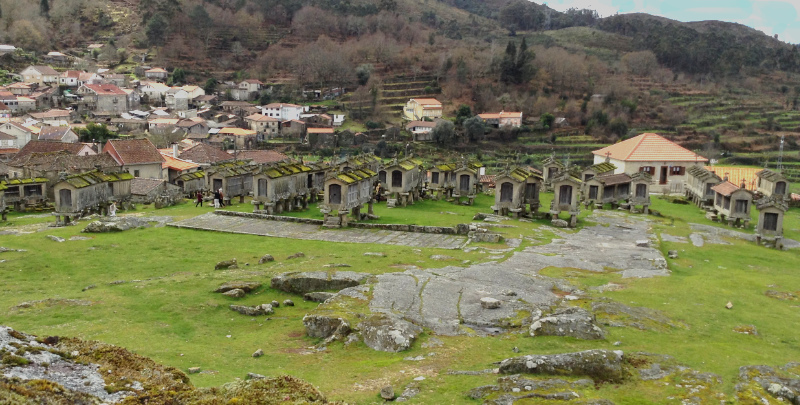 Looking around Lindoso at that time, I found it hard to believe either that anywhere could be much poorer than this isolated upland village or indeed that anyone there had any goods to smuggle. The houses – well hovels really – were traditionally built with stables and cowsheds on the ground floor and living quarters up a flight of stone steps overhead. In winter, the animals would be kept out of the intemperate weather and the heat of their bodies would rise through the wooden ceiling/floor to warm the upper story: peasant central heating! Each house had its little kitchen garden and vines were trained across the narrow streets providing grapes for wine and shade from the summer sun. The streets aren't quite so poor today but you can still get a feel of what it was like 25 years ago. This abandoned house was one of many lived in in those days. Some are still inhabited but improved; many have extensions and others have been replaced by better stone houses or breeze blocks. Life isn't a lot easier though. I don't think there are many washing machines in this village as the communal tank is still very much in use. If you look carefully, you can see there is a lady thumping her washing against the stone sill. "Is the water very cold?" I asked. "What do you think?" she replied. "Of course it is!" (It was a stupid question. The water is always cold at the beginning of March.) "But what can I do? The washing has to be done." That is life today and in some ways not so very different from the time when I spoke to the rheumy-eyed smuggler of yesteryear. Have you any idea what she might have been smuggling? Just think for a minute of what it might have been? Now let me tell you what she said. "We had to go the long way out of the village because that house over there...", she let go her stick with one hand and pointed, "that house was where the customs officer lived and we had to avoid him. It was a hot journey because we all wore several dresses each to sell to the Spanish women and on our heads we carried eggs and sardines." So what had you imagined? Alcohol? Cigarettes? I bet you never thought of smuggling sardines, did you? By the way, I never got that coffee I was yearning for. There was no bar so I had to catch the bus back to Ponte da Barca feeling parched. In finding a drink, I missed the last bus back to Ponte de Lima. Having no choice, I took a taxi. The driver had been to Germany to make the money to buy his vehicle but, at the age of 45-50, he was still living with his Mum. "Did you come back to look after your Mum?" I asked. "Nah," he said. "I got fed up with city life. The air's so dirty." He stuck his finger up his nose, pulled it out again and waved it in my direction. "If I did that in Germany," he said. "It would come out all black!" So even if you miss out on the military and archaeological museums in the castle because, like me, you've come on a Monday or it's winter opening hours only, you can still go and see the kind of Portuguese village that has been there almost unchanged for centuries and even today you can meet folk like those I've told you about, who will tell you of unimagined ways of life. What a great story, Margaret. I haven't been to the museum either but I think the smuggler was probably far more interesting. I take it she meant tinned ones? Great to hear from you again. Trust all is well with you. Yes, I was fascinated by this tale and I have no idea whether she meant tinned or real sardines. Did those women on the bus with the knitted grey socks bring fresh ones up from Ponte da Barca? I've no idea. I didn't ask: I never thought of asking. Big mistake but too late to find out now.